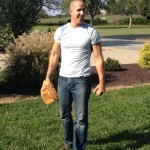 Home / Alkaline Living / Why Alkalize? Does alkalizing the body truly prevent disease or is it all hype? No need to be overwhelmed by countless articles, we’ve simplified the info so you can understand why we are so emphatic about teaching pH balancing. 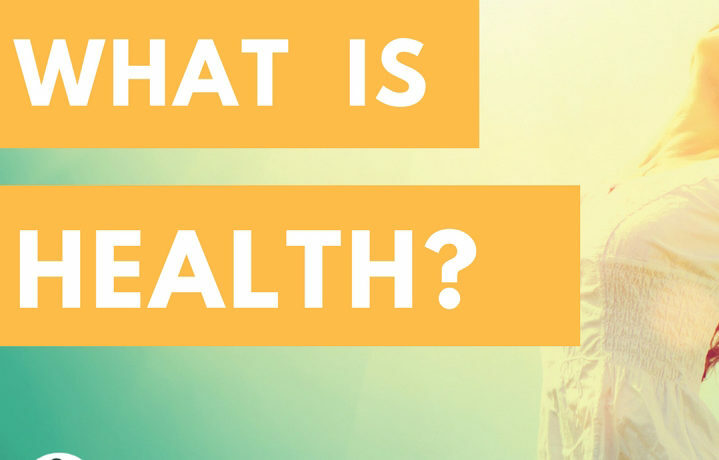 First, we will explore the basic chemistry of the pH scale as it relates to current dietary trends that is leading us down a path of suffering and disease. You will see why pH balancing the body is imperative for your health. Second, we will give you simple practices to help you get your body back into pH balance and learn the beauty of alkalizing foods and drinks to get you there. Third, we will give you lists of acid and alkaline foods to help you choose the foods you like to achieve your goal of living an alkaline life. It’s really that easy and yes, it’s THAT important! Why is alkalizing the body so important? The words acid/alkaline are thrown around irresponsibly in health and wellness circles today and it’s causing massive confusion. In order to clear the air of the acid/alkaline confusion of terms, let’s explore what the basics are concerning the pH scale. 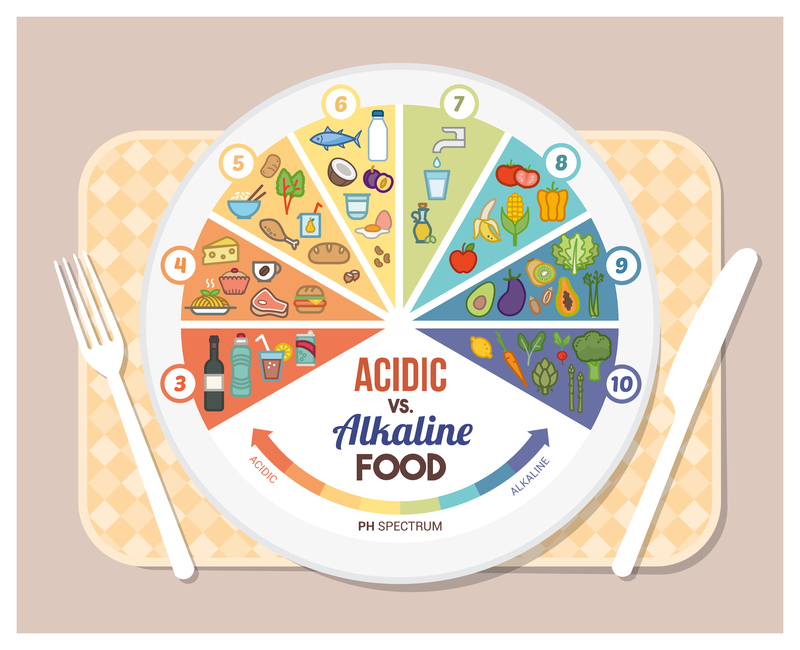 The next paragraph will get a little scientific, however, understanding the basics of acid/alkaline (pH scale) chemistry is needed, but we will keep it as simple as possible. The basics in chemistry teach us that anything ranging from a pH of 1 to 6 is acidic; a pH of 7 is neutral; and a pH of 7 to 14 is alkaline. The meaning of pH is clearly defined as, “potential hydrogen.” So anything that we eat or drink that is acidic has more hydrogen ions in it and robs the body of oxygen over time and makes the tissues in the body very acidic. The foods and drinks that we eat that are alkaline has an abundance of antioxidants in them combating free radical damage and helps to keep the blood and tissues in the body at an optimal pH level of 7.365 and creates a body with higher oxygen levels. 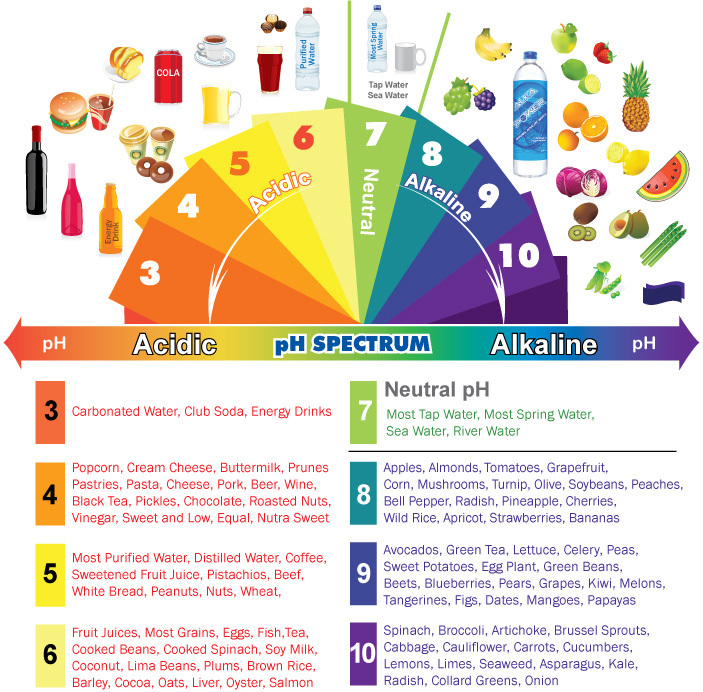 We will focus on the acidic side of the pH scale here as a precursor to section two so you can see the reasons why so many and maybe yourself are sick, tired and living with disease. What are the foods and drinks that fall in the acidic categories? The basic food groups are meat, dairy, processed foods, refined carbohydrates (anything flour based), refined oils (hydrogenated oils, vegetable oils, etc. ), refined sugar (table sugar, high fructose corn syrup, etc. ), etc. The drinks that are very acidic are alcohol, sports drinks, energy drinks, coffee, teas, acidic waters (bottled waters, reverse osmosis water, distilled water), fruit juices, etc. Majority of Americans and others around the developing world consume majority of their daily foods and drinks from the short acidic list provided above. You may find yourself in a similar place. Eating and drinking this way makes the body become very acidic and low in oxygen levels, especially the tissues making up your organs and the blood. This dietary lifestyle may cause you to have acute low energy levels, heartburn, acid reflux, increase weight gain, potentially become a diabetic, accelerate aging, reducing your capacity to heal from injury, gout, osteoporosis, joint pain, chronic fatigue, constipation, premature hair loss, yeast/fungal infections, more viral and bacterial infections, increased cancer risk, auto immune disease, etc. A dietary lifestyle dominated by the acidic side of the pH scale is one of the primary reasons why so many people are sick these days. The list of pathologies just listed above are primarily treated in modern medicine by drugs which will not address the pH imbalance in our bodies, in fact, it will only cause more toxemia in the body. As a side note, we do not discourage the use of medicine when needed, however, a sick body on multiple drugs will not give your body the capacity to become pH balanced and allow it to heal itself. 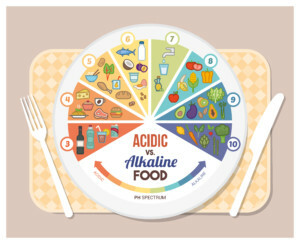 We need to keep in mind that there are different pH ranges throughout the body to keep each organ and system functioning at optimal levels, however, the focus of this article is being placed on the pH of our organs and blood which have to be at a slightly alkaline level, for example, the blood at a 7.365 pH. This is another part of all the confusion you may read online, in articles, or books. We just cannot say that the body needs to be alkaline without the clarification we are making here. It is over time that the mucosal lining that protect our organs become weakened eating and drinking highly acidic substances that turns our tissues acidic and void of healthy oxygen levels which then becomes breading ground for most pathologies and diseases. The scientist, Dr. Otto Warburg, who won a Nobel Prize in Medicine in the 1930’s discovered that cancer, viruses and bacterial infections survive and thrive in oxygen deprived acidic tissue. Everything that has been discussed thus far comes back to this great discovery made by Dr. Warburg. As you can see, eating primarily animal based foods and processed foods, drinking acidic drinks void of any minerals, and taking too many medications leads your body to become very acidic, low in oxygen, demineralized, inflamed, and eventually diseased over the long term. It is imperative that you make some changes immediately if you are sick. So how can you get your body back into pH balance? In order to do this, you must spend some time eating and drinking from the alkaline side of the pH scale. When you do this, you will provide the means necessary to increase oxygen levels in your blood and tissues, supply alkalizing minerals to neutralize the acid waste that is built up in your body and provide the body the ability to begin to health itself. Let’s look at a few simple things to do to get you started. First, one of the easiest ways to begin neutralizing over acidity in the body is drinking water. What you may not know is that all waters are not created equal. Most of the waters we consume are very acidic when you test the pH of the water. Check out this amazing Water Demonstration HERE! Tap water actually is at a neutral 7.0 pH but it is filled with chemicals and chlorine that will pollute the body and rob it of oxygen because of the chlorine. We recommend drinking medical grade ionized water called, Kangen Water. Watching the Water Demonstration, you will see the reasons why Kangen water is superior to other drinking waters. In a nutshell, this water goes through an ionization process that makes it alkaline rich, full of antioxidants and has a reduced surface tension for easier absorption by your bodily tissues. The electrical change this water goes through making it alkaline supplies your body the necessary alkalizing minerals like sodium, potassium, magnesium and potassium to neutralize acid waste in the blood and tissues. The antioxidants found in the water will help reduce free radical damage that increases aging at the tissue level. The reduced surface tension will enable the other two properties to be effective more efficiently and increase your levels of hydration. It is important to remember that this water can cause detox symptoms like headaches, dizziness, lethargy, diarrhea, etc. for some. If you are taking any medications, make sure you drink from the clean water option on the machine and wait for 30 minutes before drinking the 8.5, 9.0 and 9.5 alkaline options. It is important to start at the 8.5 level at the beginning and drink 1/2 oz. to 1 oz. of water per lb. of body weight per day. If you are experiencing severe detox symptoms, you may want to drink the water lower in volume until they subside. Detoxing is part of the process, so some level of discomfort may become a part of this pH balancing process for you. If you experience this, let it not discourage you, just stay the course, it will get better. Also, please abstain from drinking acidic drinks listed in section one because it will negate the health benefits of drinking the Kangen water. After about a month of drinking the water, you can reintroduce drinks like coffee and tea but only a cup or two per day because they are highly acidic. You can make coffee and tea with the Kangen water as well to reduce the acidic content. Second, greens, greens, greens!!! Some of the highest alkaline foods on the planet are leafy green vegetables. These foods are filled with alkaline rich minerals, chlorophyll and antioxidants that will supply your body the nutrients necessary to neutralize acids in the body. If you want to increase the alkalizing effects of green vegetables, then we recommend taking our Core Greens superfood. In it, you will find 14 super alkalizing ingredients that will give your body a power punch to neutralize acid waste and help you pH balance your body faster and all you do is mix it with in water, juice, a smoothie, etc. Our book, “Living Alkaline In An Acidic World” gives you plenty of recipes to add greens into savory and sweet dishes. These recipes are great for those who have a sensitive palate and are picky eaters. You’ll be surprised how easily our Core Greens can be hidden in recipes! Third, we recommend that you start taking digestive enzymes and probiotics to help you digest your foods such as our Digestive Health or Core Health Pack. 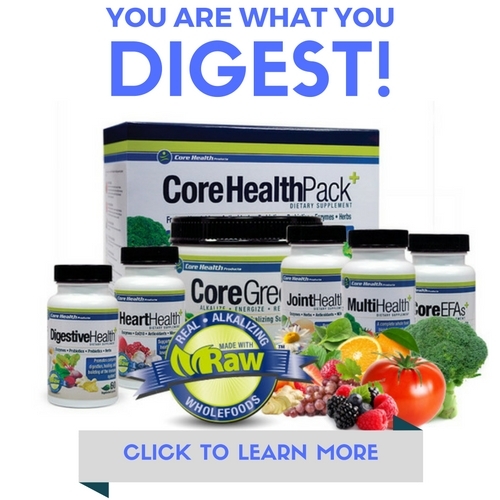 What you may not realize is that undigested food we eat causes lots of acid waste in the body that reduces your energy levels, increase inflammation, increase free radical damage, demineralize our connective tissues and bones and age our bodies. Whether it’s healthy cooked food or processed food mentioned in section one, our bodies have a hard time breaking these foods down because the enzymes in the food are dead, so supplying it with a plant based digestive enzyme and probiotic product will benefit you. We know that you and others will still consume dairy and meats so giving your body these enzymes will ensure complete breakdown of these foods and reduce metabolic acid waste in the body. Fourth, meditation or relaxation techniques. Our lives are filled with stress and when we are stressed out, the body produces lots of acid waste, so doing meditative or relaxation practices will help the body avoid becoming too acidic from stress. Some relaxation techniques require deep breathing and this will increase oxygen levels in your body and help to neutralize acids as well. Something you can do to check your pH throughout the day is to purchase pH strips to test your saliva and urine. Saliva and urine should test between 6.8 to 7.2. I get that anything below 7.0 pH is acidic but slightly below around 6.8 is not too far off but you may be surprised how acidic you are. Many people who eat mostly animal based foods and dairy are in the 4 to 6 pH range, also those with advanced diseases like cancer are very acidic as well. 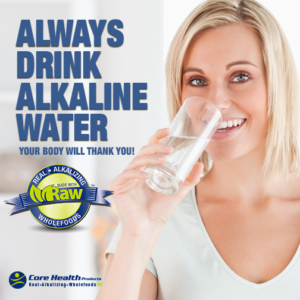 It will take time for your body to reach slightly alkaline levels so try not to get discouraged if it takes a few weeks or so. You will get there!!! One of the things that was not mentioned in section one that will help you see that this process takes time is that for every number below 7 on the pH scale is 10 times more acidic than a neutral reading of 7. So if you test between 4 and 6 you are 1000 to 10 times more acidic than you need to be. Don’t worry, just increase your intake of the alkaline foods listed below and incorporate the recommendations above and you will get there!! There are healthy foods that fall into the acidic categories like good fats, healthy fruits, organic herbal teas, meats (organic grass fed) and seafood (wild caught), and organic dairy products (butter, kefir/yogurt) but reducing your consumption of them for some time to get you back into pH balance will be necessary, especially, if you have an advanced terminal disease. If you do consume and avoid complete abstinence from them, we just recommend that you take the Core Health Pack and/or Digestive Health to help you digest these foods to help reduce the amount of acid waste produced by these foods. Get ready to experience your best health yet with Real Alkalizing Wholefoods! To life, health, longevity and happiness!! How do I access your products in Nigeria? We can ship internationally to Nigeria. Thanks for asking Edet!